He is an outstanding communicator and ensures he adapts his communication style based upon the needs of the individual to whom he provides care. This has allowed him to build strong working relationships with his clients within a short period of time. His written records are also of a high standard which enables Caremark and other professionals to continually and effectively monitor the service. In addition Ian communicates regularly with his colleagues and managers to ensure that important information is relayed to the office and those involved in the care of the clients he supports. This also includes families and professionals as required. Ian has proved to be a reliable member of staff and is the first to volunteer to cover any visits required in times of sickness and holiday. He is a strong team player who works really well with the team and supports his colleagues wherever he can to ensure best practice is followed and that consistently high care is delivered by Caremark. Although Ian is a relative newcomer to care, he has already received written compliments from clients in relation to his kind, caring and empathetic approach; one was sent to the office and to the local authority contracts department of the client he supports as a testament to how pleased the family was with his care delivery! 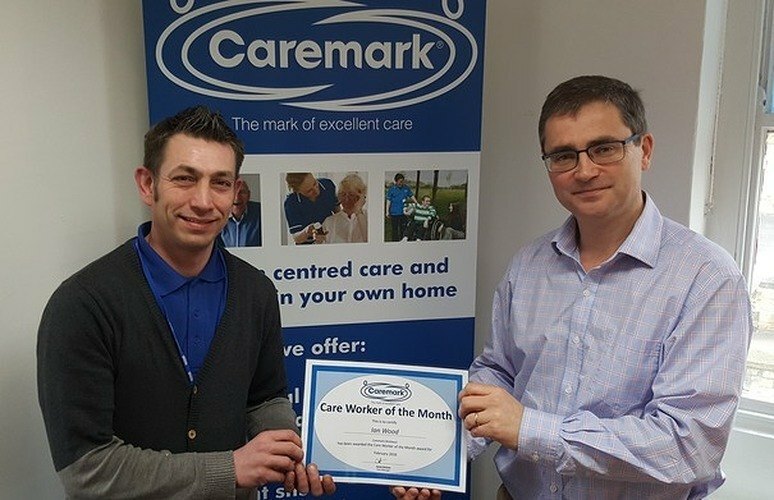 Care Manager, James Denison said: "Ian is a shining example of an individual who places the industry's core values at the centre of everything he does. This, I feel is an example that every Care Worker within the sector should aspire to. Ian's working practice is a prime example of the quality of care being provided across the majority of the social care sector despite the recent bad press surrounding social care."